This event is free and open to all, however donations to the Friends of Newton Cemetery & Arboretum are welcome and support arboretum education and care. Have you seen all the tree care being done at Newton Cemetery & Arboretum this year? Did you know the arborists working here call the Cemetery “Land of the Giants” because of the many gigantic trees here? Come celebrate Arbor Day and learn about all the tree work that’s happening at this year’s Spring Tree Tour – “Land of the Giants” –Saturday, April 27th. 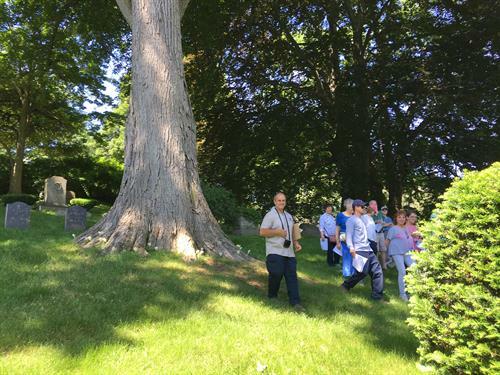 Cemetery arborist Abigale Parker and Bartlett Tree Experts arborist Andrew Balon will discuss the ongoing maintenance program, future plans and share other fun tree facts! The tour will last approximately 90 minutes and take place rain or shine. Comfortable walking shoes, water and plenty of questions are recommended. Meet outside the main office just inside the front gate at 791 Walnut Street, Newton Massachusetts. Parking is available along the cemetery roads or the chapel parking lot. For more information, call 617-332-0047. Newton Cemetery is an accredited Arboretum with ArbNet.